Uchiwa can generate wind anywhere without using electricity.There are many convenient items these days: air conditioners, electric fan, ice packs. But each has its limitations – things like electricity and mobility.In comparison, the Uchiwa can provide a refuge from the heat with no preparation at all. In its several hundred years of existence, the uchiwa has maintained its simple shape. Uchiwa functions by fanning air. It has traditionally been used to get over summer heat, and to build fire from charcoal until the emergence of propane. These days, I use the uchiwa to build fires at barbecues It’s common to see uchiwa at festivals and fireworks events. Sushi chefs use it to make sushi rice . 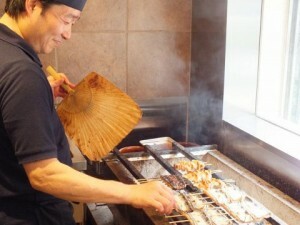 It’s even used to prepare grilled unagi and yakitori. It’s an item that’s closely tied to Japanese life. In the past, uchiwas were handmade using bamboo and washi, but lately plastic uchiwas have become more mainstream. These days uchiwas are also seen as advertising material for companies, as well as at concerts for pop stars, where fans attach the singers’ names or photos on the front of the uchiwa. Each artisan is unique in characteristic. Boshu-Uchiwa received a special designation by the Minister of Economy, Trade, and Industry, as an official traditional craft of Japan. Kyo-Uchiwa even crafts uchiwas decorated with gold and silver. There are other unique uchiwas called “Water Uchiwas.” Its uniqueness lies in its transparent appearance and resilience to water. 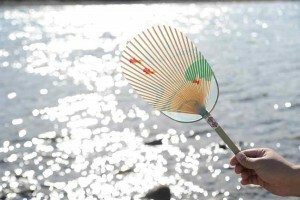 Water Uchiwa is crafted from washi paper made of the fiber smaller than normal. It is then varnished so as to be water resilient. Water Uchiwa cools its surroundings by evaporating off water while being fanned. It is especially comforting to know the amount of care placed in each fan by the artisans. Modern uchiwas are convenient, but don’t you think it’s stylish to own one traditional uchiwa? It might be fun to match your uchiwa to the color of your summer kimono or yukata. The beautiful patterns and colors might even calm your nerves on that hot summer day.. 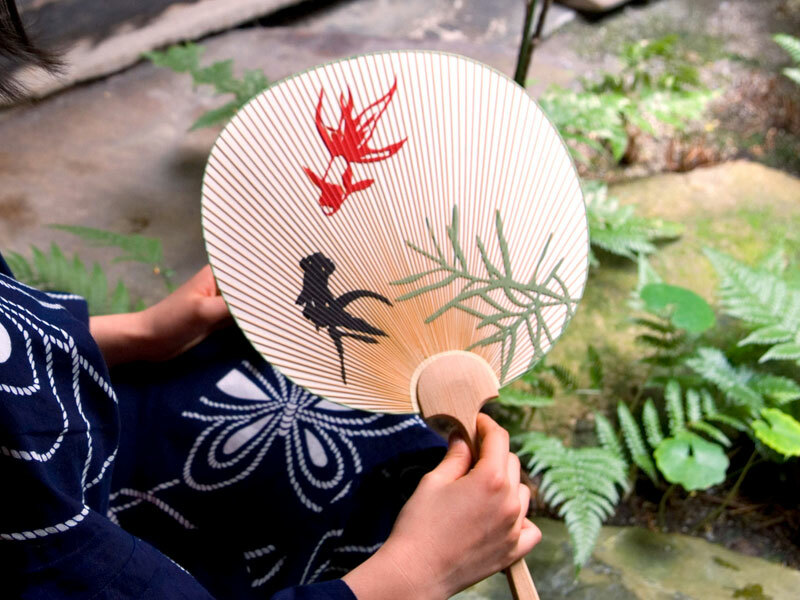 Lately uchiwa artisans have started to experiment with new designs, materials, and dyes, to incorporate modern trends with tradition. I’m sure you will notice the difference if you see one first hand!